Village West Marina & Resort – More than just a marina. It's a destination. MORE THAN JUST A MARINA. IT’S A DESTINATION. Click to view all of our rates! Village West Marina & Resort is located by land just 1 mile west of Interstate 5 on Benjamin Holt Drive in beautiful Stockton, California. By water, we are ideally located along Fourteenmile Slough. The Marina is nestled in a well-protected, man-made basin in the heart of Northern California’s Delta. Direct access for boating and fishing enthusiasts is provided via the San Joaquin River/Stockton Deep Water Channel to the California Delta waterways, San Francisco and the Pacific Ocean. At Village West Marina & Resort, we have over 680 covered boat berths and about 20 open slips that accommodate boats ranging in size from 20 feet to yachts of up to 80 feet. In addition to boat slips, our facilities also include guest and gas docks, a dockside convenience store, two of the Delta’s finest restaurants, a service and detail facility, and a yacht sales office, as well as basic necessities such as clean showers, heated and cooled restrooms, and laundry facilities. If you’re looking for marinas on the Delta, Village West Marina & Resort is known as the best full-service marina for a reason. Contact us today and check out our berth rates here. We’re so proud and honored to have been awarded The Record’s Best of San Joaquin 2016‘s #1 Marina for the second consecutive year. Just when you thought we were out of amazing new amenities to add to our wonderful little slice of heaven, now open for reservations is Riverside RV Park! We have both 40′ and 50′ spots, and all 9 of the spaces are right on the waterfront and include concrete pads, water, 50 amp and 30 amp electricity, sewer at each site, and a picnic table. To make your 2019 getaway reservation give us a call today! Village West Marina & Resort is located by land just two miles west of Interstate 5 on Benjamin Holt Drive in beautiful Stockton, California. By water, we are ideally located along Fourteenmile Slough. The Marina is nestled in a well-protected, man-made basin in the heart of Northern California’s Delta. Direct access for boating and fishing enthusiasts is provided via the San Joaquin River/Stockton Deep Water Channel to the California Delta waterways, San Francisco and the Pacific Ocean. 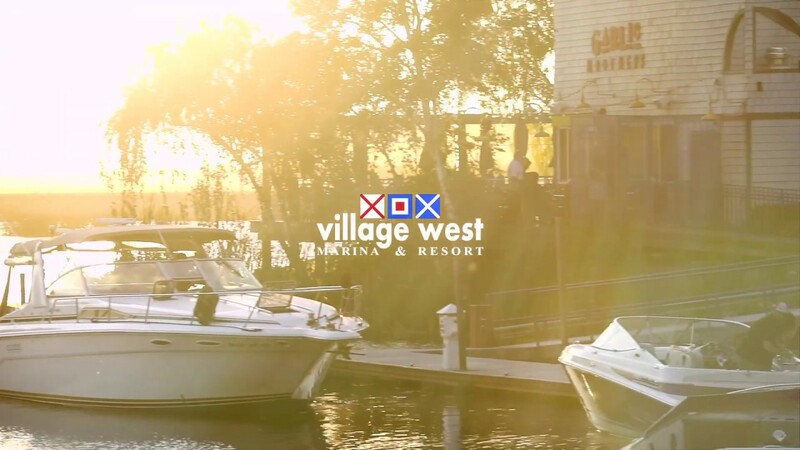 Known as the best-full service marina on the Delta, Village West Marina & Resort is so much more than just a marina. We have 680 covered boat berths and about 20 open slips which accommodate boats ranging in size from 20 feet to 80 feet. In addition to boat slips, our facilities also include guest and gas docks, a dockside convenience store, a new waterfront fishing deck, our Riverside RV Park, “The Bungalows” waterfront vacation rentals, two of the Delta’s finest restaurants, a service and detail facility, and a yacht sales office, as well as basic necessities such as clean showers, heated and cooled restrooms and laundry facilities. Take a break from the sun or make a quick pit-stop on your way out to the Delta and get yourself some Goodies-to-Go at our new Stop & Shop Convenience Store! You can party (responsibly) on the water, and stock up your boat at our new dockside Stop & Shop Convenience Store. Here’s just one more great reason to make Village West Marina your launch pad to good times on the California Delta. Garlic Brothers offers a wide variety of menu items inspired by the distinct taste of the area’s only wood-fired grill oven. Stop in at the bar for a house original “Large Marge” or Mai Tai. You’ll also find a great selection of micro-brewed beers on tap or wines by the glass. Bob’s at the Marina is famous for its fabulous breakfasts and fantastic lunches. Bob’s Giant Hamburger has been voted “The Best of the Best” in San Joaquin County nine years straight.